I usually use a waffle mix, but I thought I'd do a little better this year and actually make some from scratch. After all, it's easy. And I got a great recipe from my friend Kristina, who's sadly no longer blogging. It seems that everyone has their own recipe for waffles, yet every waffle I've ever tried tastes remarkably similar. Isn't that strange? The recipes vary quite a bit! My mineral water wasn't all that sparkly, so I added a teaspoon of baking powder right before baking, just to get some extra crisp. You can probably omit it. Anyway. These were great - very light and crispy. And thus perfect for loading with whipped cream and cloudberry jam. 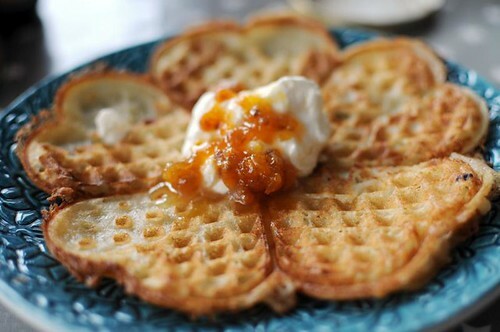 Yippee, I'll definitely be celebrating with some yummy coconut flour waffles! Thank you for sharing this very awesome recipe. We really enjoyed our first Home Made Crispy Waffles yesterday as our breakfast. It so yummy! My Kids love it so much!